Saute the leek and mushrooms until the leeks have softened. Add the chard and prosciutto and saute until the chard is wilted and the prosciutto is lightly browned. In a medium bowl, beat together the eggs, milk, cheese, salt, and pepper until fluffy*. Fold in the prosciutto/veggie mixture. Oil or butter an 8x8-inch baking dish. Pour the mixture into the dish and bake for 40 minutes or until fully set in the middle. Allow to cool 5 minutes. Slice into 9 squares and serve. Why not Swiss-Italian? Italian from the frittata and proscuitto, Swiss from the (dubious origins so I'm stretching here) the Swiss chard and the Gruyère (although the French fight over that too). 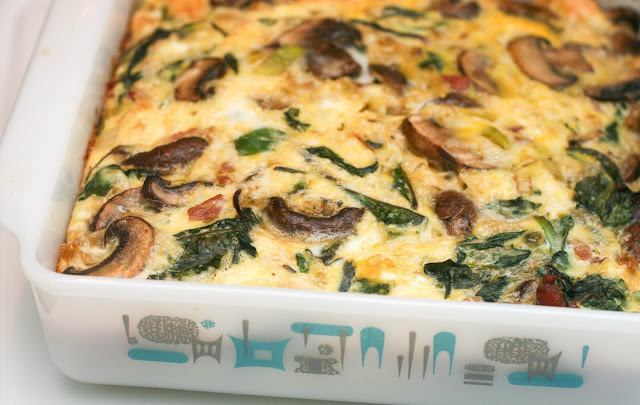 It's easier to say that "Prosciutto, Swiss Chard Frittata with Mushrooms, Leeks, and Gruyère", right? I made this one using produce from my locally grown produce box delivery. I don't get it every single week, especially during the colder months but these were all things that were grown in greenhouses from what I could tell and super flavorful. The baby chard was super cute and easy to use (I didn't bother to do anything more than wash it) but regular chard can be used, just chop it up (stems and all) and saute. The prosciutto adds a savory, meaty flavor but could easily be left out for a vegetarian meal. We like to have this for dinner but it would make a great breakfast or brunch dish too.